Despite attempting to reassure the public that all is well under its artificial seas, SeaWorld continues to face criticism from the general public: A new class-action lawsuit against SeaWorld claims that the park made hundreds of millions of dollars from its “Shamu Show,” all while hiding the truth of how its killer whales were treated. In a class action lawsuit filed in the United States District Court Southern District of California [PDF], the lead plaintiff says that she would never have paid SeaWorld Entertainment for tickets or membership if she had known about alleged orca abuse. While the park claimed that whales and humans there lived in harmony and played together for public entertainment, the lawsuit claims there’s a side to the park visitors don’t know about — and if they did, the park wouldn’t be raking in the dough. “This illusion masks the ugly truth about the unhealthy and despairing lives of these whales. 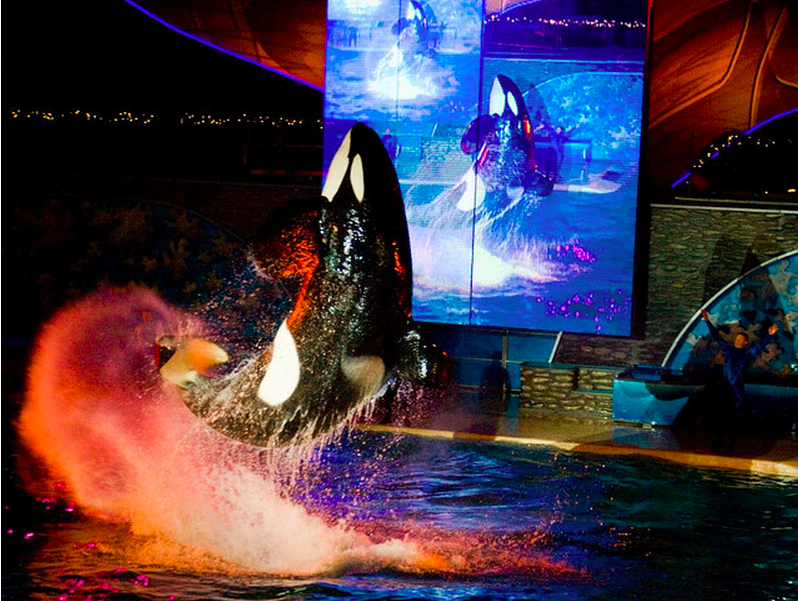 This is a truth that, if known to the purchasing public at the time families make the decision to visit SeaWorld, buy a membership, or pay for an ‘exclusive park experience,’ would lead them to seek entertainment elsewhere,” according to the May 7 lawsuit. The 87-page lawsuit (via Courthouse News) alleges that such treatment means whales at SeaWorld die many years before they would in the wild, and that the park lies to the public about how long orcas usually live. It also outlines the alleged potential dangers faced by trainers at SeaWorld, as evidenced by the death of trainer Dawn Brancheau, which was chronicled in the 2013 movie Blackfish. After the documentary about the 32 years Tilikum spent at SeaWorld leading up to the moment when he dragged Brancheau to her death below the water, the backlash against the park was widespread, with schools canceling field trips and musical acts canceling scheduled performances at the park. Corporate sponsors like Southwest Airlines and Taco Bell also cut ties, the lawsuit notes. Despite this, the complaint says anyone who questions the idea of making money from captive whales is accused of “radicalism” and “extremism” by SeaWorld, which continues to claim that its whales are treated well and have “fun” lives in captivity, the complaint adds. The three co-plaintiffs want to represent customers who bought SeaWorld tickets, memberships or other orca “experience” products at the San Diego, Orlando and Texas facilities before they became aware of the park’s alleged mistreatment of its captive whales, and seek injunctive relief requiring SeaWorld to stop with its alleged misleading business practices. SeaWorld has been trying to repair its tarnished public image, launching a campaign called “Ask SeaWorld” and pledging to spend $10 million on orca research and expand the whale environment at the park, among other things. But although SeaWorld has said it beefed up safety measures for its workers, earlier this month the Occupational Safety and Health Administration in California cited SeaWorld San Diego for not properly protecting employees.